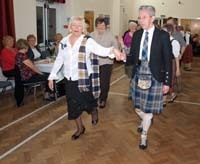 Saturday 20th January 2012 saw the Demonstration Team head off to Bromborough Golf Club to perform at the first of their Burn's Night events of the year. 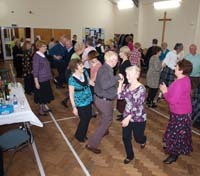 This venue is a new one for the Team and it was interesting to see the very new and stylish club house at Bromborough. The club facilities are very good but then golf club membership fees do not come cheap! cheap! 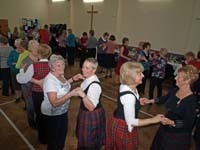 The Demonstration Team, lead by Gill & Dave Haynes, consisted of Diana D, Liz, Hilary, Carol, Helen, Ada, and Herbie. The golf club members were part way through their extensive Burn's Night Supper when we arrived, so Gill took the opportunity to distribute little advertising "business cards" onto each of the dining tables (it always pays to advertise). She commented afterwards that she doubted if she had ever seen more glasses on tables at any dinner! The Demonstration Team are to be congratulated on their excellent performances - very well received by a small but appreciative audience. 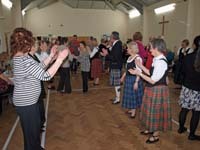 The dancing surface was hard, very small and the room stiflingly hot and dry (we drank many glasses of ice cold water), but everyone coped brilliantly with the conditions and did the Branch proud. 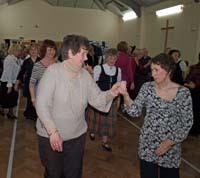 The Burn's season is not over yet - the next performance by the Demonstration Team will be a full blown Ceilidh Evening with the Wirral Keep Fit Association at St John's Church Hall in Meols (Saturday 28th January). 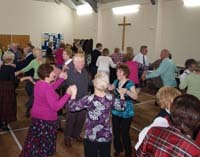 The Demonstration Team have been involved with the Wirral Keep Fit Association Burn's Night, held at St John's Church Hall in Meols, for more years than any of us care to remember. 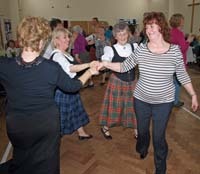 It is always a really rewarding, if exhausting, event with the "audience" very eager to take part in all the dances. 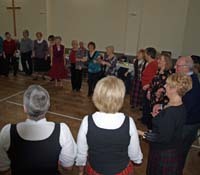 Everyone is keen to tackle even quite complicated dances and our repetoire has expanded enormously over the years - circle, round-the-room and couple dances; 3 couple sets, 4 couple longways and square sets and even unusual set arrangements (eg 6 couple Becket style). A big thank you to all the Team members who put so much effort into this event and still manage to smile, even when feet get trampled. Also a big thank you to Geraldine and everyone at WKF for inviting us and impressing upon us how much everyone enjoys the evening.